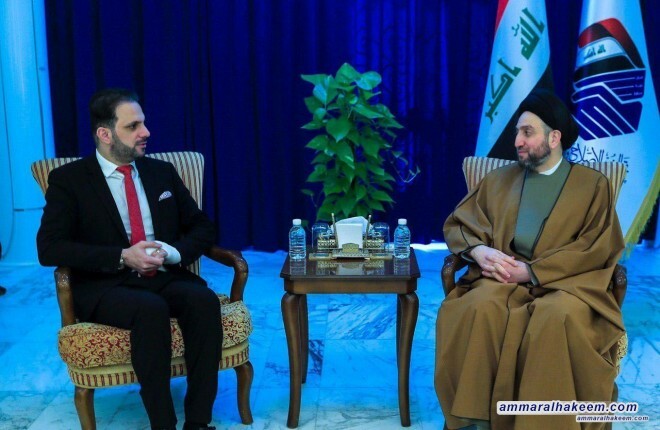 His eminence with Abdulwahid discussed latest political situation in Iraq and the region, stressed the need to focus ob priorities of the phase in terms of providing services, provision Job opportunities and fighting corruption. His eminence stressed that priorities are pressing issues in all of Iraq and there is hardly any area in Iraq without needs to address these priorities, stressed on the importance of favouring public interests over sectarian interests and the need to take into account the changes that took place in Iraq which are forming a government headed by an independent personage and creating unbiased national alliances. His eminence explained that these joint political unbiased national alliances represent an important portal to address the political issues and pave the way, if they were to institutionalize, for the poles of pro-goverment and opposition in the upcoming elections, and highlighted the steps taken by the Reform and Reconstruction Alliance, electing the president,forming committees and align positions.